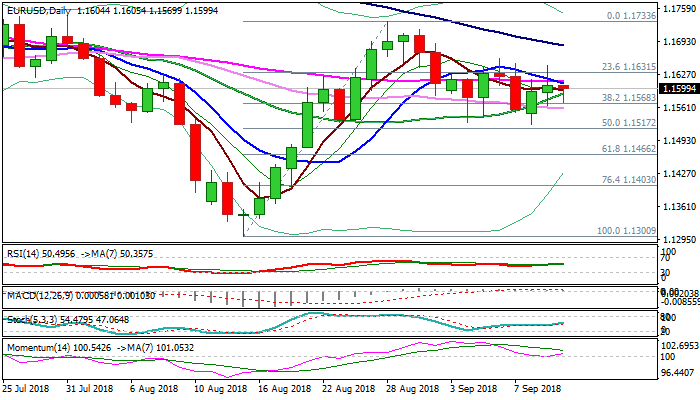 The Euro stands at the back foot in early Wednesday's trading, but remains within choppy consolidation between 30SMA (1.1557) and 55SMA (1.1612). Tuesday's long-legged Doji candle confirms near-term scenario, with focus on Thursday's ECB policy meeting which could produce fresh direction signal. Upside potential exists and is supported by rising bullish momentum, with 30SMA required to hold. Break above 55SMA would generate initial bullish signal, with break and close above thin daily cloud (spanned between 1.1649 and 1.1678 and is turning lower on Thursday) and falling 100SMA (1.1685), is needed to open way for attack at key barriers at 1.1733/50 (28 Aug high / late Aug lower platform). Alternatively, bearish signal could be expected on close below 30SMA, which would unmask 1.1526 (10Sep low) and open way for further retracement of 1.1300/1.1733 ascend.